Unmatched as a good all around contractor lift, the Series 2100 features taller mast to reach desired work heights while requiring fewer mast sections. hence, the 2100 is less expensive and lighter. The base, forks, winch, etc. are the same as the 2000. Highly reliable, single-speed winch uses idler roller to feed four rollers to feed cable evenly on the drum to avoid cable flats. Hard tread urethane wheels with Delrin® bearings. No tools or loose hardware to worry about. Leg lock mechanism releases with the push of a button and locks in the stored position. 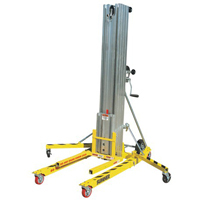 Leg rollers allow lift to be wheeled around. Forks remove by pulling plunger pins. Makes loading a truck or van hassle free. Mounted on base top, stabilizer legs fold down with ease and lock in place.